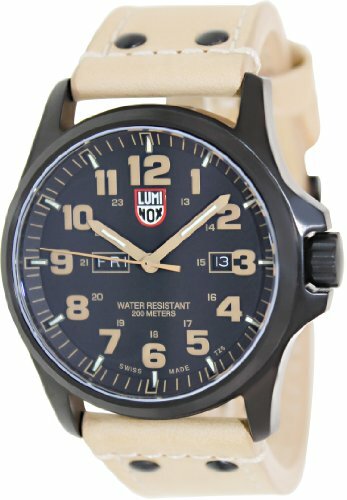 Upgrade any outfit with this casual timepiece by Luminox. Showcasing a trendy 48 mm black stainless-steel case and beige leather band, this watch allows you to show off some style without having to try. This watch also displays an eye-catching black dial with beige details, making this a must-have watch with a lot to offer. Additional features include luminous, water-resistant, Arabic numeral display, measures seconds, screw-down crown, and has a day and date display.Atacama Field Day Collection.